Click below to view the 2016 Taste and See event. I called in to see my sister who has four young children, I took a small Christmas booklet with me, which I had found in a magazine, to share with them. Whilst there, I began to read the booklet to my nephew and niece, my niece jumped up and exclaimed ‘that was in my school assembly!’ It emerged that the assembly that Fearne was talking about was the recent Schools team Christmas presentation. Fearne said “Lloyd was great, and the lady with spikey hair!’ Fearne loves drama, so she really liked the acting and the costumes. She found it a really fun and memorable assembly and loved learning about God through it. The theme of the booklet I had shared, by Bob Hartman, was that God made what was sad, glad again, through Jesus. That is what Fearne had recognised when we were reading. The team had been inspired by the rhyming format and the strong message in the booklet, and had used it as a platform for writing their assembly. Fearne was so excited that afternoon, I explained a little bit more about Jesus to her and after finishing reading the whole booklet about Jesus’ life, Fearne wanted to pray, so I helped her to do this. It was a very special time for my niece and me. ‘One of the most thought provoking ways of telling the Easter Story’ said Father Andrew of St. Georges Church, Kemptown. 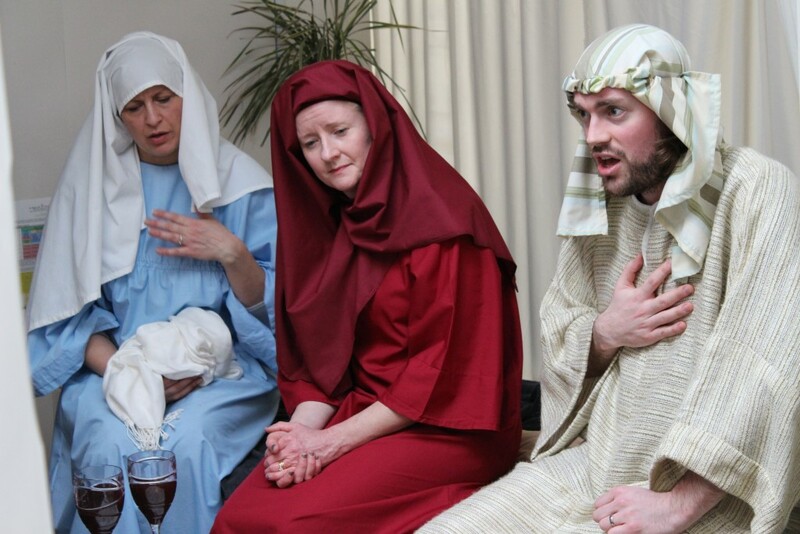 He was referring to the interactive retelling of Peter, Mary Magdalene and Mary, mother of Jesus’ stories as the Schools team took on the roles of witnesses to Jesus, after he had risen. The team donned costumes and characters and got the children thinking in a different way during an RE Pause Day at St Mark’s Church of England Primary School. The children had begun the day in their classes to consider a ‘Big Question’. The team then presented their Easter Assembly to the whole school, where they used a giant ‘chocolate egg’. The children were transfixed as they moved it around to make elements of Jesus’ life and how it led to the Easter story. All through the day the children filtered through to spend time with the team in year groups for a half hour slot, accompanied by their teaching staff. They began with those in early year’s foundation stage, who enjoyed hearing the story of how Mary and Peter had seen the empty tomb. They were invited to suspend their belief and spend time in Marys ‘house’ where all three of the team shared their parts of the story giving some time at the end for any questions the children had. As the day went on and the year groups came to visit, the curiosity of the children grew and clearly they had got a great deal from the day. This was apparent by the end of the day when the team got some great questions, ending with some deep reflective ones from those in years 5 and 6. So it was a big thumbs up for the RE Day in St Marks and the team look forward to others ways in the future that they can work together to support learning. If you would like something similar in the school that you teach in, contact the Schools team by emailing schools@bhcm.org.uk.